LAKE BUENA VISTA, Fla. (Feb. 26, 2018) – Golden Oak, the luxury residential community located at Walt Disney World Resort, today announced plans for the first-ever homes with modern architectural style within the community’s Four Seasons Private Residences Orlando neighborhood. This expansion of Golden Oak’s design palette is in response to high demand from a generation of homebuyers seeking modern residences that embrace Florida’s climate and lifestyle year-round. Award-winning, Orlando-based builders Phil Kean and Rial Jones are the first to bring to life this new architectural style in a community best known for a traditional European aesthetic. Joining the portfolio of local builders within the Four Seasons Private Residences neighborhood, Kean is recognized as a pacesetter of modern residential design in Central Florida. He has transformed the traditional floorplan by blurring the lines between inside and out to create a new Florida classic. 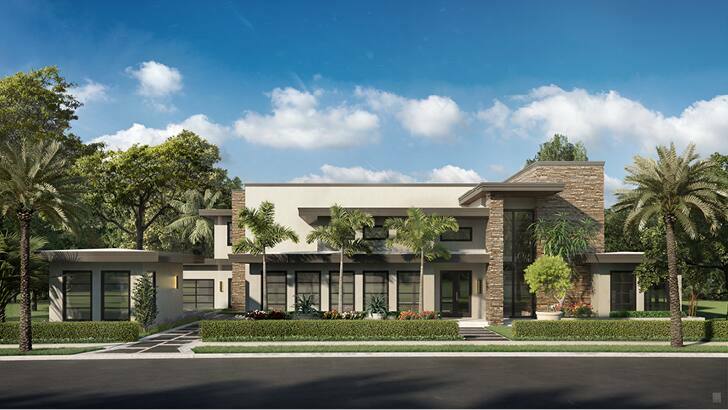 Kean’s namesake firm, Phil Kean Design Group (PKDG), is an award-winning, design-driven architecture, construction and interior design firm located in Winter Park, Fla.
Kean’s first home is currently in development and set to debut in summer 2019. The earthy color palette and resort feel lend to the future home’s inspired name, “Nyumbani,” which means “home” in Swahili. Special features included in the current plans for the home are: sweeping indoor/outdoor living areas; a four-sided custom glass fireplace that serves as the home’s centerpiece; a vanishing-edge pool with multiple water features; a Phil Kean signature reflecting staircase highlighted by innovative lighting details; a Phil Kean signature contemporary kitchen well-appointed with three islands and a glass enclosed wine room; a separate catering kitchen; home theater; game room with accompanying wet bar; an exercise suite inclusive of sauna and steam shower; and a detached casita. The home will feature folding glass walls erasing separation between indoor and outdoor living, bringing to life the tropical landscaping for which Florida is known. Distinct features of Jones’ home will include floor-to-ceiling glass walls offering striking views of the pool, water features and landscaping from the moment upon entering the home, a glass tower featuring a floating staircase and 1950s inspired stone details in the master bath. Jones joined the portfolio of builders at Golden Oak in 2011 and he is the president and founder of Jones Clayton construction, established in 1984. He was motivated to start working in modern home design because of the desire for this architectural style from his clientele, who come from all around the world for his impeccable construction. Nestled within the Golden Oak community, the Four Seasons Private Residences Orlando neighborhood provides residents the year-round amenities and concierge-style services of the Golden Oak Club, complemented by the personalized and à la carte services of the neighboring Four Seasons Resort Orlando. Led by a dedicated Director of Residences, an expertly trained staff is available to arrange experiences within a resident’s personal home. These services, available for an additional fee, include: resort deliveries to residences, in-residence spa treatments, personal laundry and dry cleaning and towel and bed linen services. Assistance arranging private parties, residential maintenance, cleaning and personal shopping also is available. and expert hair and nail services all designed to help guests look and feel their best. fitness classes and holiday events. For more information about Four Seasons Private Residences Orlando and Walt Disney World Resort, visit www.orlandoprivateresidences.com or call (407) 939-5577. *The information above reflects current services and amenities, which are available on a non-exclusive basis and subject to change without notice. Annual fees apply, with certain services and amenities also requiring an additional fee. Golden Oak brings together family, friends, and cherished Disney traditions in a unique, luxury residential community of single-family custom homes with prices starting at $2 million. To live at Golden Oak is to enjoy a year-round lifestyle that includes distinctive neighborhoods, expansive nature preserves, and an unsurpassed array of amenities and concierge-style resident services. The community also includes parks, biking and walking trails and the Four Seasons Resort Orlando at Walt Disney World Resort. Golden Oak features six neighborhoods, including the Four Seasons Private Residences Orlando. The community is anticipated to include approximately 300 homes and encompass 980 acres. For more information about Golden Oak, please call (407) 939-5577 or visit disneygoldenoak.com. Founded in 1960, Four Seasons Hotels and Resorts is dedicated to perfecting the travel experience through continual innovation and the highest standards of hospitality. Currently operating 109 hotels and resorts, and 38 residential properties in major city centres and resort destinations in 46 countries, and with more than 50 projects under planning or development, Four Seasons consistently ranks among the world's best hotels and most prestigious brands in reader polls, traveler reviews and industry awards. For more information and reservations, visit fourseasons.com. For the latest news, visit press.fourseasons.com and follow @FourSeasonsPR on Twitter. Phil Kean Design Group (PKDG), is an award-winning, design-driven Architecture, Construction and Interior Design firm located in Winter Park, Florida. PKDG was named 2017 “Builder of the Year” by the Orlando Business Journal and 2016 “Builder of the Year” by the Florida Association of the American Institute of Architects. PKDG was also the Architect, Builder and Interior Designer of the 2017 and 2012 New American Homes, the official show homes of the 2017 and 2012 International Builders Shows, respectively. In addition, PKDG’s custom homes have won seven “Grand Awards” from the Orlando Parade of Homes, four “Golden Aurora Awards” for best custom home in the Southeast and “Home of the Year” in the Best in American Living Awards program. A Certified Green Professional, Kean is steadfast to his commitment to sustainability and energy-efficiency. PKDG has garnered multiple “green” awards including the AIA Orlando Sustainable Design Award, LEED-H Project of the Year Award, Florida Green Building Coalition’s Highest Scoring Certified Home of the Year Award, Grand Aurora Award for Best Energy Efficient Home and the Orlando Business Journal’s “Top Green Project” of the Year Award. Kean’s quality construction and his utilization of the latest in “green” construction products and methods have elevated his firm’s reputation to one of the most experienced residential “green” builders in central Florida. Since 1984, Jones Clayton Construction has earned a reputation for excellence in custom home building industry, recognized throughout Central Florida for its timeless architecture and one-of-a-kind home design. President and founder, Rial Jones, is a current member and past president of the Master Custom Builder Council, an organization dedicated to the highest level of construction and ethical standards. Under his leadership, Jones Clayton has won numerous awards including, the “Grand Award” from The Parade of Homes, “Best Custom Home Award” from Builder Magazine and “The Golden Aurora” for best custom home in the Southeast.